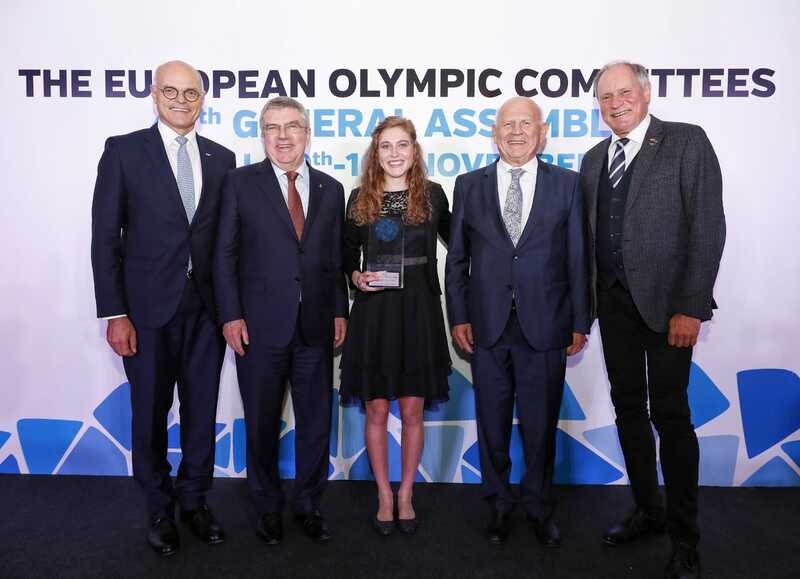 Austrian racing cyclist Laura Stigger was awarded the 8th Summer Piotr Nurowski Prize during a gala dinner tonight during the 47th General Assembly of the European Olympic Committees (EOC) in Marbella, Spain. Stigger had an impressive year in 2018, winning the Junior Road Race World Championships in Innsbruck, the Junior (XCO) World Championships in Lenzerheide and the Junior European Championships (XCO) in Graz. She also medalled at the Buenos Aires 2018 Youth Olympic Games. Laura has been mountain biking for over 10 years, giving free rein to her passion for nature and taking risks. She has won almost every race she has competed in over the last five years, except for one race where she finished second after suffering a flat tire during the competition. Stigger took the prize for Europe’s Best Young Summer Athlete ahead of a strong field of finalists that also included canoeist Eva Alina Hocevar (SLO) and swimmer Ajna Kesely (HUN), who finished joint second, and tennis player Iga Światek (POL) and track cyclist Jakub Stastny (Czech Republic), who finished joint fourth. All five finalists gave presentations earlier in the day to the General Assembly, which then held a vote to determine the winner, which was announced at the dinner. Each finalist received financial assistance from the EOC for training and educational purposes. Stigger was awarded €15,000, while the joint second finishers (Eva Alina Hocevar and Ajna Kesely) secured €8,000 and the joint fourth (Iga Światek and Jakub Stastny) €3,000 respectively. For more information on the Piotr Nurowski Prize and former recipients click here.